Please help to spread the word by tweeting the link in the title. "Living in the fast lane tests everyone's limits"
"Wow!! 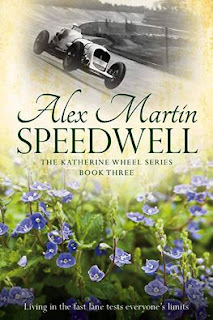 To put it in the vernacular of the era of Speedwell, what a rip-roaring book!" "This is a book that leaves you weeping and cheering at the same time. " "Life is full of surprises - some of them shocking - and in Speedwell, there are plenty of times when this feels true." "There is such a richness of plot here to keep us glued to the characters' triumphs and defeats, loves, losses and surprises too." "I simply loved this series and can't wait for the next one to be published. It has been a roller coaster of emotion reading books one to three and I have fallen for the characters and their stories. Kate, Jem, Douglas and Cassandra stole my heart."